Hammer Museum exhibition and events series, September 27 - December 30, 2018. Cosponsored by CERS. 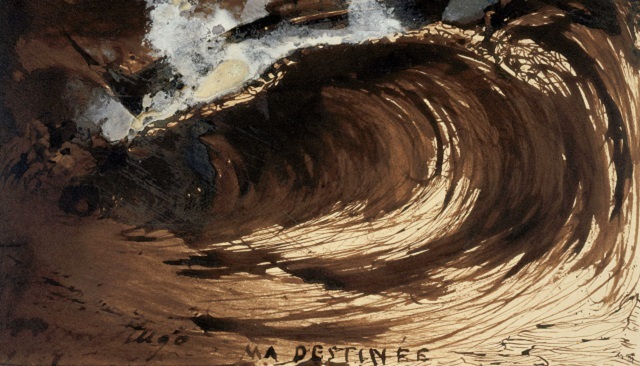 Victor Hugo, Ma destinée (My destiny), 1867, cropped. Poet, novelist, playwright and critic Victor Hugo (1802–1885) was a preeminent figure in the social, political and cultural life of nineteenth century France. One of the greatest writers of all time, he was also an accomplished draftsman and produced a lesser known but remarkable body of works on paper. Hugo’s drawing practice was largely a private endeavor and although over three thousand sheets by him survive today, they were rarely seen in public during his lifetime. Many were produced during his extended exile on the Channel Islands of Jersey and Guernsey between 1852 and 1870. The sole American museum exhibition devoted to his graphic work to date was organized by the Drawing Center in New York in 1998. The Hammer Museum’s exhibition, September 27 - December 30, 2018, will reconsider Hugo’s experimental and enigmatic practice as a visual artist for a new generation of audiences in America.